Every 1000 years, a woman called a Millennial Queen is sent from the planet La-Metal to secretly rule over the Earth and lead an underground organization that secretly controls the entire planet. Promethium, known to Earthlings as Yukino Yayoi, is the current Millennial Queen. Some early movie promotional material identified her as Promethium II, and indicated that she was the daughter of the Queen Promethium of the Machine Empire of Galaxy Express 999 (another of Matsumoto's works). This idea (and the suffix, II) was later dropped, however, and Millenial Queen Promethium/Yayoi was considered to be the person who would eventually become the Machine Queen (see Maetel Legend). While shown with rounder eyes in the anime TV series, she is shown with almond-shaped eyes in both the manga and the anime film and looks just like Maetel from Galaxy Express 999. In the anime TV and manga, Yayoi lives on the second floor of a ramen shop run by an older couple who have adopted her as their daughter. She has a tiger-striped cat. In the anime film, in addition to being Professor Amamori&#039;s private secretary, she also teaches at a school and lives in a high-class apartment. 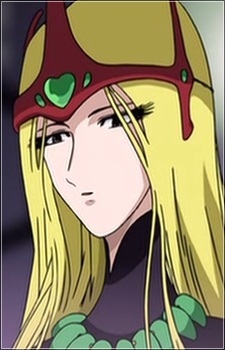 In the anime TV series called Maetel Legend, Space Symphony Maetel and Galaxy Express 999 (also in GE 999 movies), Promethium, mother of Maetel and Emeraldas is the main antagonist. Unlike in the Millennial Queen TV series, and the movie, La Andromeda's intentions are to convert all humanity into cyborgs, whether they like it or not. Ironically, she puts her daughters, Maetel and Emeraldas in a difficult position similar to how her mother, Millennial Queen from the Queen Millennia series (Mother of Yayoi, and Selen) did to her and Selen, where they must fight for their own beliefs and stop the Queen. Initially however, when Promethium had a human body, she was a motherly queen who loved her daughters, Maetel and Emeraldas. But as she desired for eternal life, without having to suffer from illness, aging, and starvation, she allowed herself to be converted into a cyborg, as shown in Maetel Legend. Soon after, she realizes that she is losing her human qualities, most importantly the quality of love. As a result, she regrets having a mechanical body despite its advantages. When she realizes that her mind is finally out of control, she asks Maetel to kill her as shown in Space Symphony Maetel. Although Maetel and Emeraldas supposedly killed Promethium in Space Symphony Maetel, Promethium's evil spirit still lives. In the Galaxy Express 999 TV series, Promethium finally gets killed by Maetel and Tetsuro, with the destruction of La Metal. Yayoi Yukino, Promethium II opposes Lalela and her plan to wipe out all mankind to gain etneral spring for La Metallians, unlike in the anime where she is pressured by her own mother, Promethium I to destroy mankind in order to keep La Metal's traditional cycle going. In the end, Promethium II dies after weakening Lalela by shooting her with a pistol. Promethium, also known as Yayoi Yukino is the princess of La Metal, and was to become the next Queen Millennia. However, she betrays La Metal and the current Millennial Queen for the sake of the earth and a young boy named Hajime. After joining forces with her older sister Selen, she manages to save the Earth from total annihilation. It is likely that she is the same Promethium appeared in the Maetel Legend, though Queen Millennia series and Maetel's series (Maetel Legend, Space Symphony Maetel, Galaxy Express 999) could possibly irrelevant.